Yesterday, it was the opening day at LEGOWORLD 2011 in Zwolle, and of course we got news without any delay. One picture of the new mini turntable appeared, that dispels any and all doubts about its size, aspect and functionality. Presenting the new turntable for 2012! There is absolutely no doubt that it has indeed 28 teeth, and it turns out that the speculation presented together with the pictures for 1H2012 sets was right in terms of attachment points. 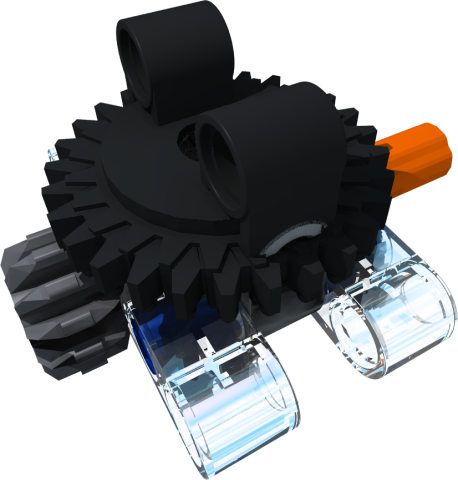 Also we can clearly see, from the above picture, how the turntable’s upper and lower parts attach to each other. I hoped the new turntable would be more useful if it had a pin hole going through it instead of an axle hole or simply nothing, but it turns out the LEGO Designers are much more ingenious than that. Instead of a round or cross hole, the turntable has a square hole! 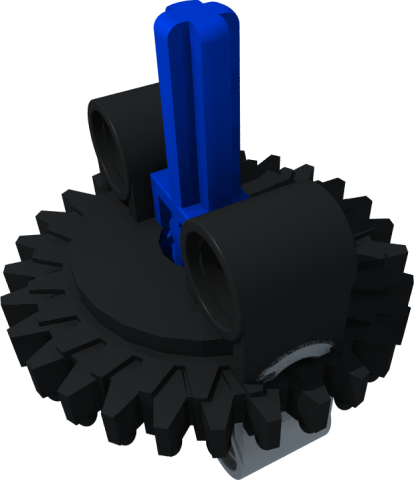 This not only allows for one axle to transmit movement through the turntable, like with a round hole, but opens a lot of other possibilities like those suggested below (sorry for the quality of the images, I seriously lack the LDraw element modeling talents). 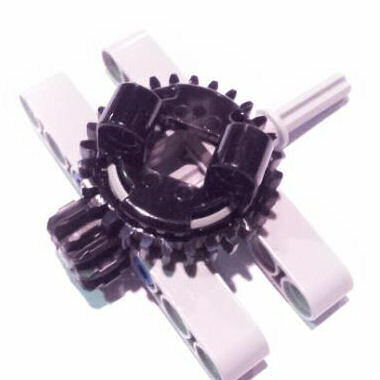 We can pass a free-spinning axle, as expected. 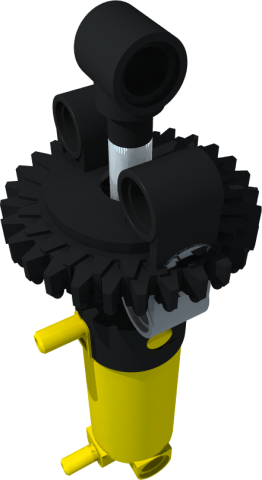 We can use a Technic Pole Reverser Handle or equivalent element to lock the turntable to a concentric axle, so that we don't have to use the outer teeth to rotate it. We can pass up to four pneumatic tubes; however, this many tubes on such a small diameter may easily over-twist. We can pass the piston of a pneumatic cylinder, linear actuator or their mini versions, which have parts with a square cross-section. The mLA, in particular, seems especially appropriate for the task. We can have a U-joint, axle joiner or other wider-than-axle elements partially inside the turntable. We can pass a standard beam, possibly for some kind of structural reinforcement. 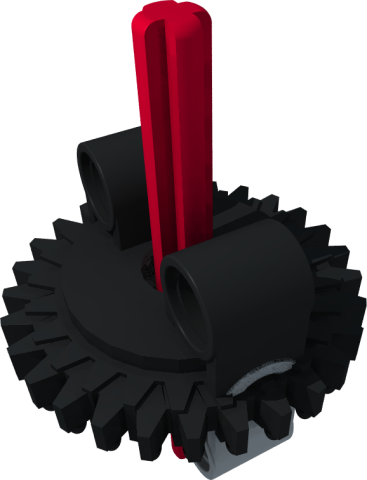 Of course, there’s also the mechanism on both the 9391 Mini Crane and the 9397 Logging Truck: an axle goes through the turntable’s supports and ends in a 12T gear, which meshes directly with the turntable. Sometimes, new elements appear to have very specific purposes and narrow niches of application, but this new element will surely come in handy in lots of situations! 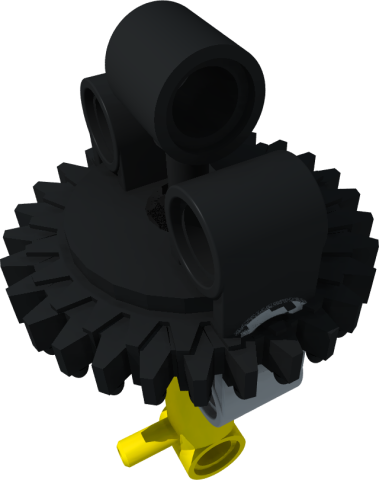 With all these gears Lego should come out with brass colored ones for the Steampunk crowd. This looks really great! So many possibilities Cant wait to get my hands on one!! I actually have the black upper part of this mini turntable right here. I found it at LW in one of the crates in the LEGO tents where you can buy parts for 8 cents per gramm. I realized it was a small turntable but didn't know it was a new part. I was hoping to find the connecting part but didn't probably is grey. So I didn't find it. If you want additional info, feel free to contact me. What I'm now curious to see, is a photo from the bottom part (the grey one). Because for it to work as expected, the whole should be probably circular, with a diameter at least equal to diagonal from the upper square. 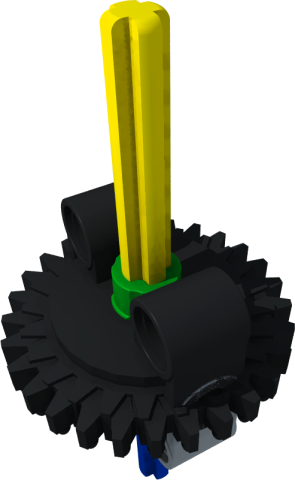 This may have raised some constraints on the bottom part design, namely on the way the connecting protrusions attach to the circular base. A very good point! Indeed, two rotating squares are harder to match than two rotating circles. Off the top of my head, I'd say that the most logical choice from a strength point of view is that there is another square hole at the bottom, the same size as the top hole. While putting together the model, one would have to temporarily rotate the turntable to align the holes and make room for elements with square cross-sections like cylinders (pneumatic or mechanical) to pass. Then, when rotating, the hole in the turntable would behave like a circular hole. 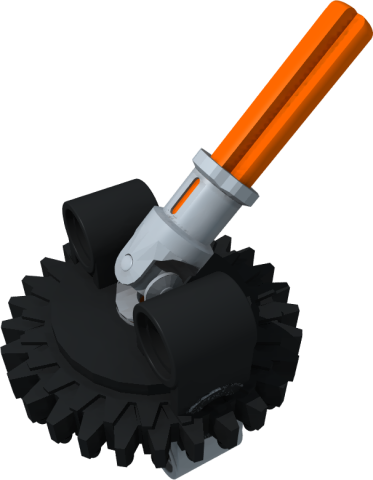 This limits many of the usage suggestions on the post, but at least the protrusions in the bottom can be full-size and strong. In the lower part will be now room for a bigger hole than the one in the black upper part. Maybe a beam could be used to lock te two parts from turning? The part number of the upper black part is 99010 btw. I rather suspect the bottom hole is also square. Even if it isn't, it doesn't matter because when you look at the geometry of the support pieces attached to the bottom of the turntable the effect is a square. This is evident in the photo. This means that as the turntable rotates, for the most part we have an octagonal hole. This would have a pretty significant impact on the ability to build some of the suggested structures. Yes, the bottom part has also a square hole, the same size as the upper part. Just if they want to make it lockable. So this is a very good compromise, since it's still possible to pass cilinder rods, axles, etc.. Yes, you're right in your POV! It came to my mind that this new small turntable might be useful to build pendular suspensions. Also, a new possible usage for the mini turntable came now to my head: trains. 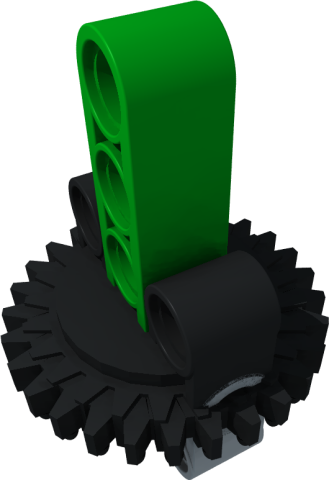 As can be seen on the Technic article at Railbricks 10, these could be used to stiffen the transmission on locomotives with the motor on the main body. 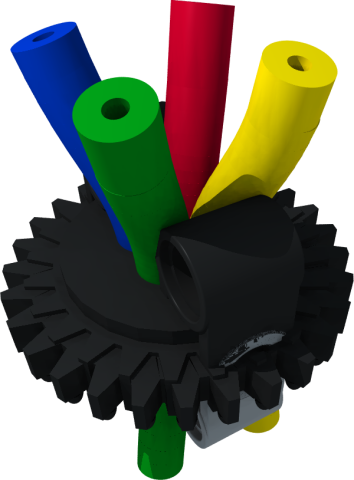 "might be useful to build pendular suspensions"
ooh! now yer speaking my language. do elborate.